The disabled don’t need our sympathy, they need our help. By sympathizing with them we focus only on what they don’t have. However, by helping them we can help them in utilizing what they have. The first step in this direction would be to help them overcome their disability so that they can live a more normal life. We can do this by making them aware of the latest innovations in disability aids. 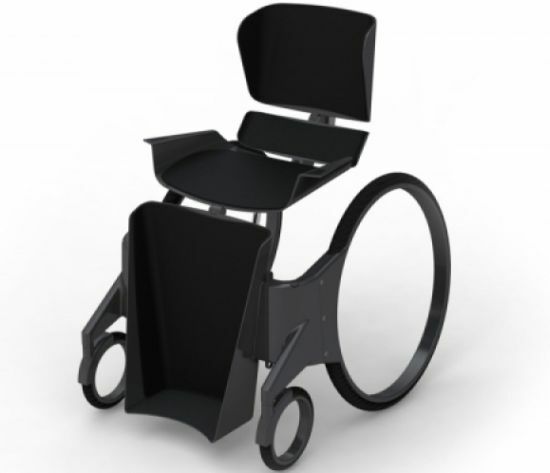 One of the latest and most innovative among them is this Urban Wheelchair. Often wheelchair users have to face a number of problems. In order to accomplish their day-to-day tasks in urban environment, they have to work very hard. This is especially the case when away from home on their own. Providing a solution, UK-based designer Ben Thorpe has come up with an innovative solution. He has come up with a fully electric, lifting wheelchair. 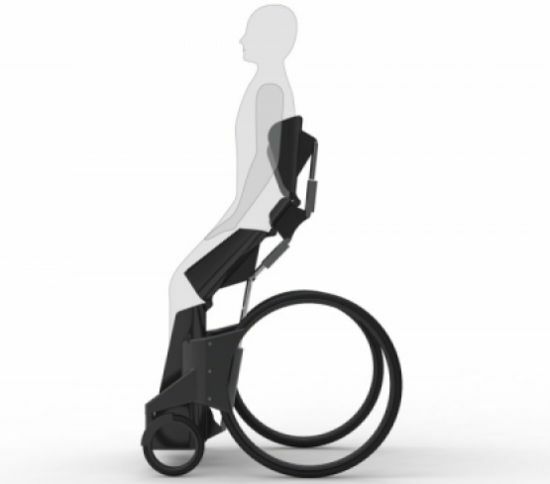 The lifting mechanism of the chair lifts the user in an upright position to improve their reach. Moreover, it also assists them in conversing face-to-face with people in their day-to-day lives. 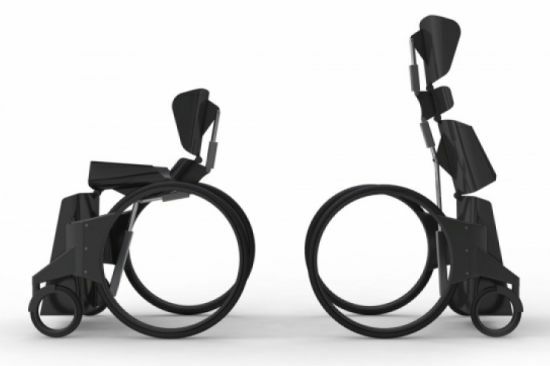 The “Urban Wheelchair,” as the designer hails his design, moves on hubless wheels. It has a tight ball bearing system to reduce rolling resistance, which not only gives it trendy looks but also increases its efficiency. It generates power from two lithium-ion batteries, which is present both sides of the seat. 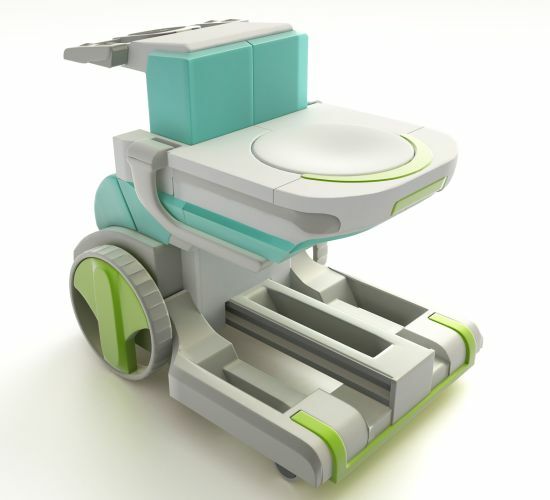 The fully rechargeable wheelchair runs on one battery. One the other hand, you have to charge to power the 12v linear actuators that lift the seat. The chair constitutes of mainly high-quality materials. These materials include Grade 5 Titanium that make it not only lightweight but at the same time strong. 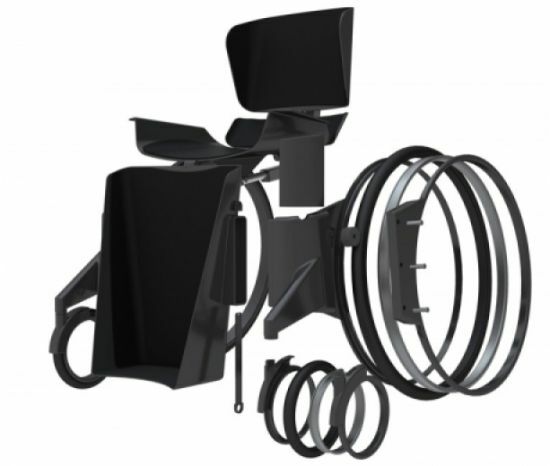 The hubless wheelchair integrates a seat manufactured with a digital technique called Selective Laser Sintering. 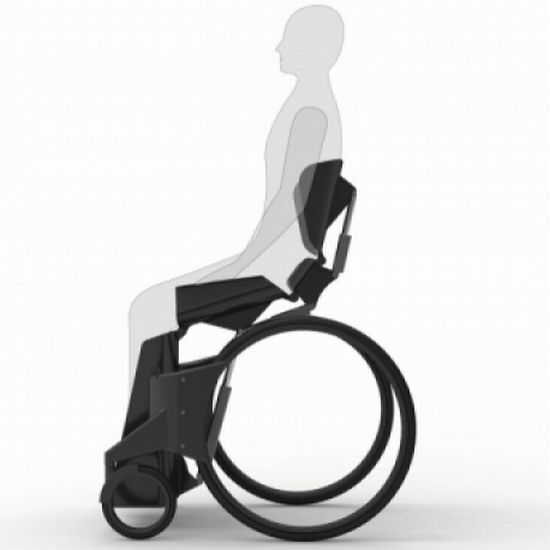 This enables users to mold the seat area according to their body shape or size to have an MRI scan of their body. 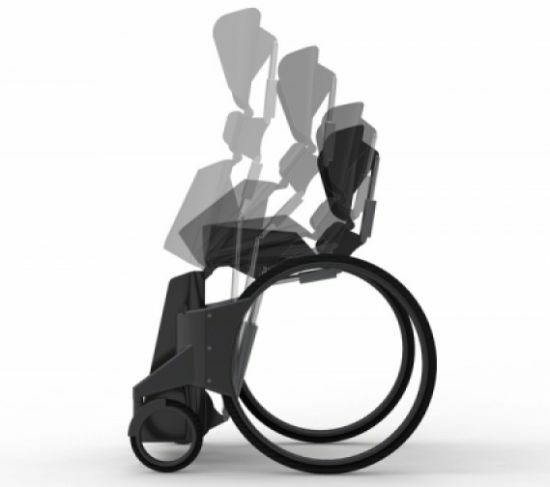 Wheelchairs have never been as customizable as this electric wheelchair. 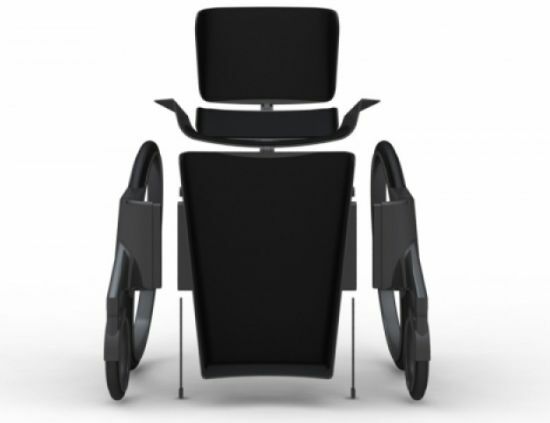 This chair is for people living with paraparesis, elderly people and patients with below waist disabilities. The “NATULIFT” by Turkish designer Duygu Guler is a disability aid, which enables the transfer of patients with disabilities. These transfers include transferring the patient to and from swimming and rehabilitation pools. The flexibility of the product makes it compatible with different seats, beds and pools. Moreover, it helps in adjusting to all heights and ground surfaces. The sliding seat combines with the design’s main body and is able to go in and under the water carrying the patient. The armrests also take three different positions. They provide a secure and comfortable mobility to the patient. Before the lift, you have to move the motor to the rear for extra balance support while the seat is moving towards the pool carrying the patient. The sensor technology allows the instrument to align easily by the poolside. Furthermore, you can use the vacuum system for the stabilization. The product focuses on safety in each stage of the transfer, creating aqua therapy more accessible by decreasing the physical load of mobility. The design provides a light, simple use for the operator and a comfortable as well as a smooth ride for the passenger. To make life easier for disabled and elderly people, Cenk Aytekin has designed a hi-tech uphill transportation vehicle called “Liftup.” The project helps in improving the mobility and independence of such groups, especially in developing countries. 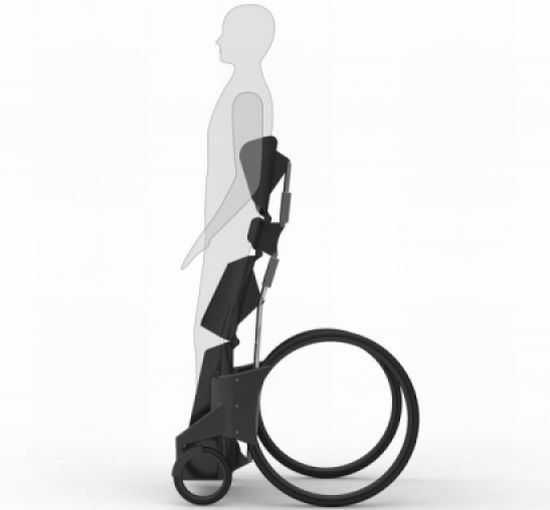 This technically sound innovation provides support and enhances their self-confidence, overshadowing the prevailing wheelchair mechanics. The Liftup is based on the working principle of the funicular transportation. Built up on the emergency ribbons or on the pavement, this electrical vehicle is suitable for its use only in residential areas such as public housing possessing sound infrastructure with low density of population. It is designed to cover well-maintained short range distances of 50-150 meters and does not take into consideration the areas located on rough terrains. Keeping to the preference criteria of disabled and elderly people, the design offers open spaced structure with a foldable seat allowing traveling in sitting or leaning posture. It is a paid mode of transportation which features a security foldable button to protect from harsh conditions, borderline for blind people, foldable structure for storage and an electric source. This easy to operate vehicle with soft back support adjusts itself to the hill’s angle and the power engine is switched on or off by the handle grip, granting personal space to the disabled and elderly people. It allows the user to choose his or her physical condition after the payment is made and a safe and independent journey starts at a speed of 5 km/s gradually attaining 10 km/s, which stops automatically on reaching the destination. In case of any mishap, the vehicle stops mechanically until everything is fixed up by the authorized service team. Liftup is a name rightly assigned to a technically rich and well thought of design, that lifts up the confidence and morale of disabled and elderly people. The DuoCycle is a must have conception for all people with disabilities. It’s one product which can motivate people to a great extent. Not only does it allow one to exercise, it also provides a lot of mobility to the user too. Coupling up utility with design, the concept bike has been designed by Wim Bussels, who specializes in product designing and networking. This ingenious creation makes use of some up-to-date technologies. 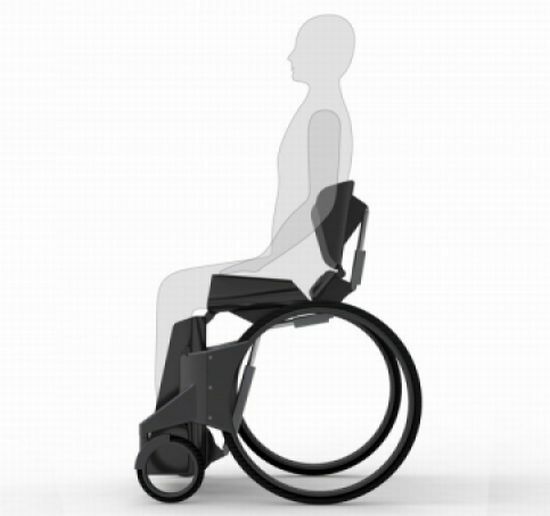 While being seated on the cycle, the user can pedal and charge the battery for the cycle. Any movement on the tricycle is further measured by the computerized battery, thereby proving to be a source of inspiration for the rider. Also, the cycle comes equipped with a hubless wheel, which makes the product’s design so unique. Of course, the person accompanying can have a total control of the person sitting in front and also has brakes to his/her aid. Keep in check the surroundings and bid goodbye to being stuck in old, useless wheelchairs. All in all, the Duo Cycle is a great concept and shall prove to be a great boon for the user, making it an instant hit. People with disabilities have to seek others’ help when it comes to commuting. Moreover, it becomes difficult for them to fetch a job to add to their woes. To make this section independent, students from Palmira Jaime Alonso Moreno have designed the E1-Ecodrive. 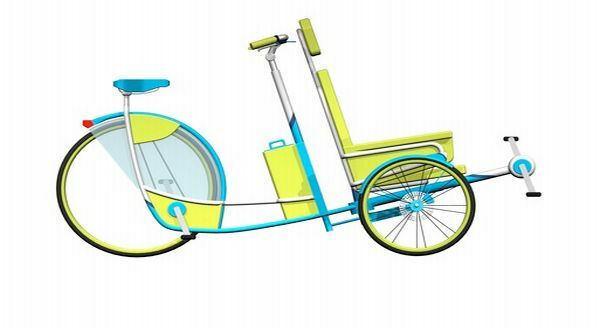 This concept will help them earn a living and add mobility into their lives. 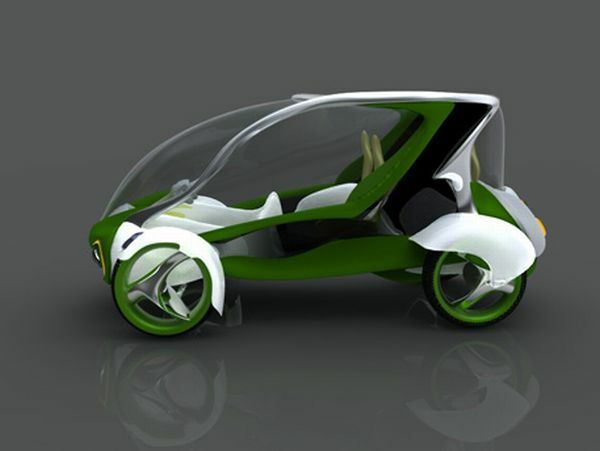 The eco taxi has been crafted from low-impact materials that will not deteriorate the environment. Unlike gas-guzzling beasts, it will run on hydrogen, electricity, biodiesel and gas. This will make it an eco friendly drive because of the usage of alternate forms of energy. The vehicle is 3.4 meters in length and has a height of 1.7 meters. Such a compact size will not consume much space and it can be maneuvered easily through tightly-packed areas. The vehicle has a capacity to seat four people. It is quite comfortable and has been wedged with appropriate safety features. E1-Ecodrive has three easy entrances, which allow passengers to get in and out of the vehicle effortlessly. The facade has been crafted in an impressive manner and will make people slip in a state of awe. It will befriend nature and pass an eco friendly style statement. E1-Ecodrive is a great way to make disabled feel good about them. It will inject a sense of positivity and make their life beautiful.